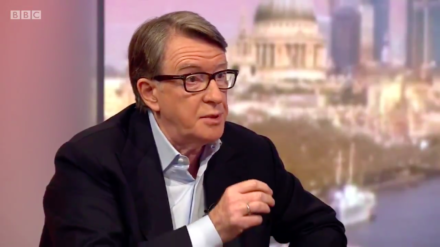 Lord Mandelson said the EU would not accept the Prime Minister’s proposed Brexit deal on The Andrew Marr Show today. “She posits two leaps of faith about how she’s going to get there: that the EU is going to accept not only that we’re going to cherry-pick sectors in goods trade, but according to her interview parts of sectors as well,” said the Labour peer and former EU trade commissioner. “I don’t believe the EU will accept that in a month of Sundays,” he added. Mandelson concluded: “What Theresa May is doing is trying to dance on the head of a pin that simply doesn’t exist”.